AS you might recall, Tony Kanaan is trying to get a date for his teammate. You know, the Japanese guy named "HIDEKI", who for some inexplicable reason HIDEKI has been unable to find himself a main squeeze here in the good 'ol U. S. of A. Not wanting to see a teammate have loneliness messing with his head at speeds over 200 mph, Tony has created a web address where young ladies can send emails, pics, vids, or possibly powerpoint presentations outlining how they would be an all-too-perfect match for young mister HIDEKI. 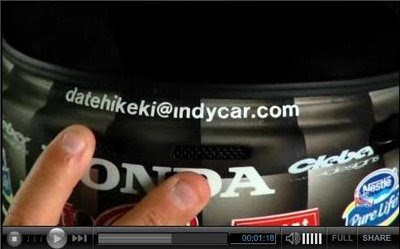 Kanaan has even put the email address on his helmet. Anyone else think Tony needs to be checked for a possible concussion? Looks like the wrong guy may get the gal. If they're looking for a guy named Hikeki, it's a winner. Hopefully Hideki won't get further down in the dumps when he realizes his potential main squeeze is running off with a guy with an 'almost' name.